Lucky Bar has all the mystery and magic of an exotic cocktail bar right out of Gotham City’s Chinatown. It’s a secret rooftop bar in the heart of Holland Village that belongs to Full of Luck Club, a contemporary Cantonese restaurant serving up both Chinese food with a modern twist (Moonlight Truffle Beef Hor Fun, anyone?) as well as classics we all know and love. 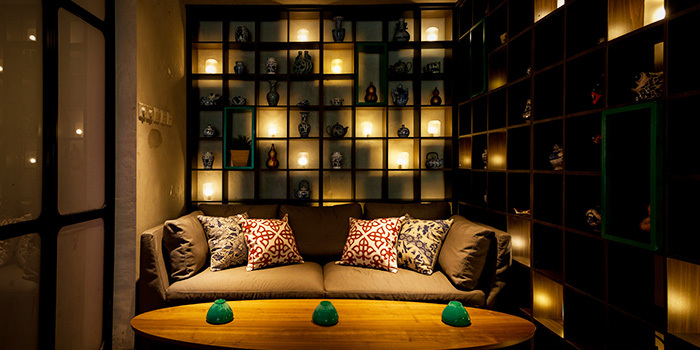 Walk through a hidden back entrance and you’ll be greeted with twinkling fairy lights, plush chinoiserie chic decor and rich dark wood furnishings – the whole place exudes exclusivity without the stuffiness, and instead has a very chilled-out vibe. It’s the perfect place for after work drinks to unwind and watch the sky fade into varying shades of purple and pink. Lucky Bar managed to break into Singapore’s competitive cocktail bar scene with a wide array of specialty concoctions that sets them apart from the rest; share a tea-infused booze-fest with a couple of friends with their Teapot Cocktails like their twist on the classic Old Fashioned (aptly named the Jade Old Fashioned instead), which contains green tea-infused scotch whisky, peach liqueur, honey and lemon bitters ($45, serves 4). The Oolong Negroni is also a must-try; its an all-time bartender’s favourite with oolong-infused fords gin, sweet vermouth and campari ($45). Tea cocktails not your thing? Fret not, you can treat yourself to a variety of other tipples their bartender expertly whips up. Their signature Lucky Cocktails are smooth and citrusy – Potion No.8 ($24) is especially satisfying as it incorporates the fragrance of exotic fruit and flowers with its a refreshing blend of rum, homemade hibiscus grenadine syrup, fresh pineapple & lemon juice. Want something more mellow? Try their Dragon’s Breath ($22) instead (we do realize that this doesn’t sound all that mellow, but you have to trust us on this)! It’s a smooth blend of High West campfire whiskey, artisanal Mezcal, homemade goji & wintermelon syrup and fresh lemon. Feeling peckish? Sprawl out on their cushy seats and enjoy some of their scrumptious grub; their One Ton Nachos ($12) are a crowd favourite with crispy wonton skins in place of tortilla chips loaded up with Chinese-style BBQ pulled pork, pineapple, lots of melted cheese and a dollop of sour cream for good measure. You could also get a portion of Golden Sand Corn (crunchy sweet corn coated with salted egg yolk, $4.80), a side so surprisingly addictive you’ll find yourself licking the bowl clean before you know it! Pop by Full of Luck Club if you’re craving something more substantial and we guarantee you’ll find anything you’d possibly want from delights like Kung Pao Fried Chicken baos (2 for $9.80) to Black Bean Smoked Duck Claypot Rice ($16) – comfort food at its best!